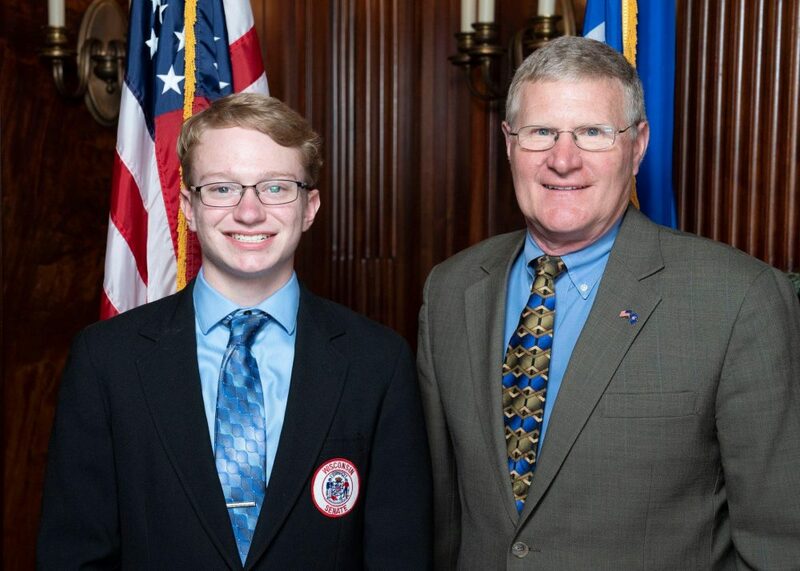 Karsten Bakken, a senior at MPHS, attended The Senate Scholar Program in Madison, WI March 3rd through March 8th. Thirty-three scholars, one from each of the Wisconsin senate districts, were selected from applicants. The Senate Scholar Program is an intensive week-long educational program offered by the Wisconsin State Senate where each Senate Scholar receives a hands-on, up-close view of the Legislature’s role in our democracy. Through involvement in the program, Senate Scholars gained experience in policy development, constituent relations, and processing legislation by working with Senators, legislative staff including the Senate Sergeant at Arms, and University of Wisconsin faculty. In addition, scholars met with executive and judicial staff members, members of the media, lobbyists, partisan and nonpartisan staff, and representatives from service agencies including the Legislative Reference Bureau, Fiscal Bureau, Audit Bureau, Technology Services Bureau, and Legislative Council. Scholars toured the state capitol, judicial chambers, legislative chambers, the governor’s office, and attended a luncheon at the executive residence. They attended assembly sessions, partisan caucus meetings, and shadowed a senate page. Scholars participated in a mock session where they presented an idea to the the Legislative Reference Bureau drafting attorney and drafted a hypothetical bill, critiqued bill drafts, held a committee hearing, drafted amendments, prepared testimony and questions to their position on the bill, and voted on their bill. Applicants to the program take a Wisconsin civics test, write a three to four page informative essay describing the support agencies for the Wisconsin State Senate, submit a resume and cover letter, submit two letters of recommendation, and contact their district’s state senator to obtain a recommendation. Bakken obtained letters of recommendation from MPHS Social Studies Teacher/Mock Trial Adviser, Terry Cool and MPHS Math Teacher/ NHS Adviser, Cynthia Nothem. Bakken contacted Senate District 17 Senator, Howard Marklein and obtained a recommendation. The Senate Scholar program is coordinated by Senate Education Outreach Officer, Dr. Tammy Wehrle. Bakken and his parents, Erik and Kipalee Bakken, wish to thank those individuals who wrote recommendations and thank those who organize and support the Senate Scholar Program.